The Nike Barcelona Home Shirt 2015-16 pays tribute to one of the greatest football clubs in the world. This authentic Nou Camp replica has been crafted from recycled plastic water bottles – meaning fans of the Spanish club will be helping the planet at the same time as cheering on their heroes. 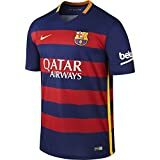 Made from lightweight polyester mesh with DriFit technology in the fabric which evaporates sweat in a heartbeat, the Barça home strip features the famous club emblem on the left chest, with an embroidered Nike Swoosh to the right.